While there's nothing particularly ugly or untoward about Treasure Island or Angel Island, they suffer the same fate as one who poses next to a glamorous movie star. Next to San Francisco and all of its great attractions, they just don't get noticed very much. But for those willing to get away from the asphalt and the crowded wharf of downtown San Francisco, and who wish to experience something new and different, these islands offer memorable views of the city, relaxation, recreation, wines, picnics and a perfect natural getaway. 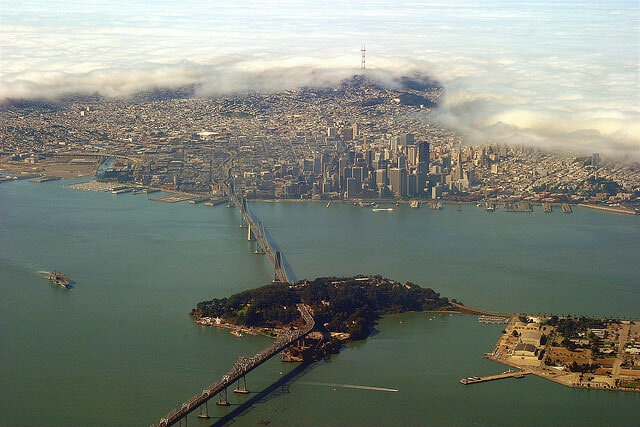 View of Treasure Island and San Francisco. 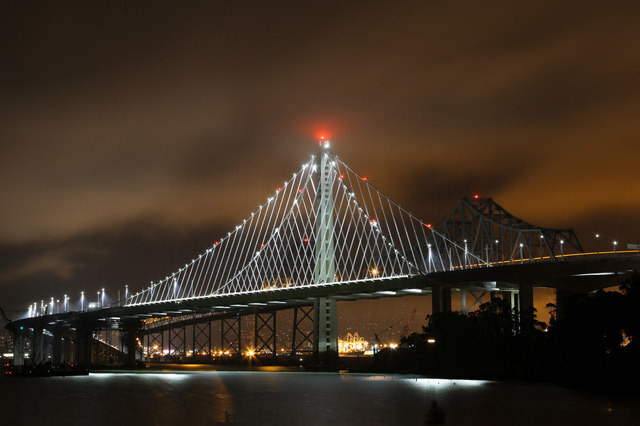 Treasure Island is halfway across the Francisco–Oakland Bay Bridge. Photo credit: Jitze Couperus. If you're not careful, you'll miss it: Just halfway driving across the San Francisco–Oakland Bay Bridge is the exit to Treasure Island. While this manmade rock lacks the infamy of a pirate's lair or the glitz of the Vegas casino that share its name, it does offer some of the best views of San Francisco's skyline. Located within San Francisco's city limits, the island originally was built for the 1939 Golden Gate International Exposition. Since, it has served as a naval station and auxiliary air facility for airships, blimps, dirigibles, planes and seaplanes. Treasure Island's incarnations include serving as a movie sound stage for segments of popular films such as The Matrix, Indiana Jones and the Last Crusade, and the Humphrey Bogart classic, The Caine Mutiny. There used to be little reason to venture onto the island except for its entrancing early-morning and dusk views of San Francisco. But today, the island is dotted with residences, specialty restaurants, craft wineries and small businesses. Treasure Island's The Winery SF produces boutique wines on the premises in its expansive facility, and offers tours, tastings and event space. On the last weekend of every month, Treasure Island's Flea Market attracts crowds searching for nuggets among scads of antiques, collectibles, and assorted vintage goods. There also are specialty food items. Admission is $3 for adults, and young'uns under 12 are free. Each fall, the island hosts the Treasure Island Music Festival, which is set for October 18–19 this year. Last year's lineup featured Beck and dozens of other bands that I don't recognize because I'm old. But just imagine dancing long into an autumn evening with San Francisco's lights in the distance, and the Bay Bridge lit up like a Christmas tree. The eastern span of the San Francisco-Oakland Bay Bridge from Treasure Island. Photo credit: Joe Parks. To get to Angel Island, you need a boat or a ferry, which can be boarded at Fisherman's Wharf. The entire island is a state park, offering hiking, biking, picnic grounds, a café and, like its nearby sibling, terrific views of the surrounding area. It's a great day trip: Just catch a 9:45 a.m. ferry, spend the day, and take a 3:00 p.m. ferry back. 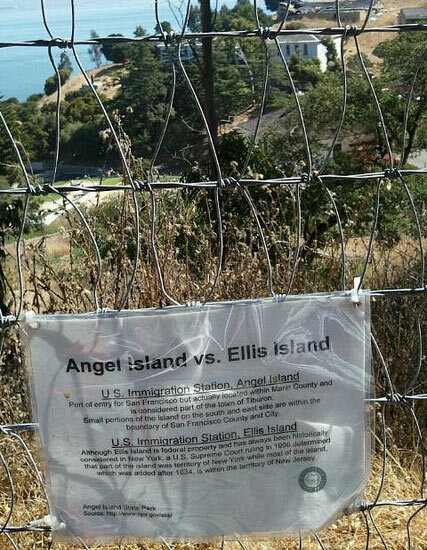 Angel Island played a significant role in Asian immigration early in the 20th century. Like New York's Ellis Island, it served as a processing center for approximately one million immigrants between 1910 and 1940. Due to restrictions placed on Asian immigrants under the Chinese Exclusion Act of 1882, many Chinese spent years on the island waiting for entry. Until September 2014, park rangers are offering interesting, brief tours of the facilities, which are now designated as National Historic Landmarks. Treat yourself to a hike to the top of Mt. Livermore, which takes about an hour of fairly moderate walking. 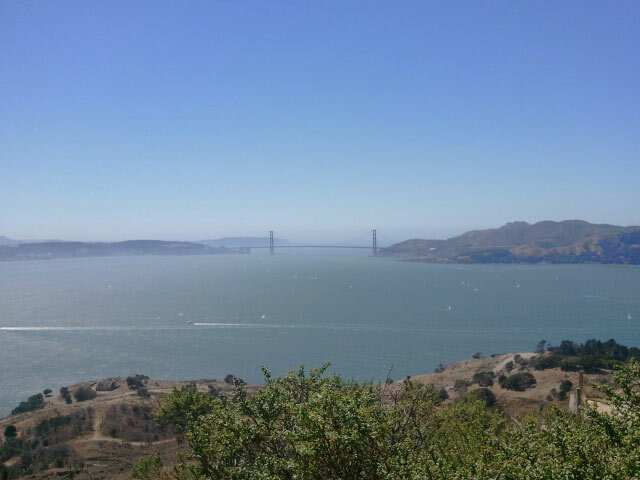 From the top, you'll enjoy a 360-degree view of the San Francisco Bay and few people. Afterwards, you'll likely want to quench your thirst at the Angel Island Café. It is small, the seating is outdoors, and it only takes credit cards for purchases of $15 or more. But it does have beer and wine, sandwiches, salads and hummus, because it is California. Between May and August, the Angel Island Cantina showcases live music on its outdoor deck. It's also a great place to ride a bike, with eight miles of traffic-free roads. Mountain bikes can be rented for $12.50 an hour or $40 for a full day — which ends at 3:00 p.m. because you need to catch the ferry. There also are electric scooters for rent or you can join a parade of Segway riders for a tour around the island.